Spring is the time of year when everything gets a fresh start. The same can be said for the mulch in your commercial landscape. Over a long Northern Ohio winter, mulch typically breaks down into the soil and loses much of its original luster from when it was first applied. If that sounds like something you’ve witnessed on your property between winter storms, now might be a great time to start thinking about scheduling a new application of mulch to your landscape beds. 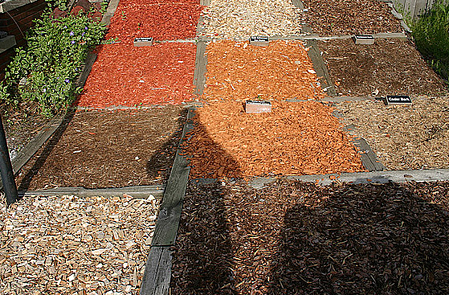 But with so many types of mulch available, there’s a lot to consider. Do all mulches perform the same? What are the best types of mulch for commercial landscapes? Today we explain the important role mulch plays in the health and success of your landscape and also take a closer look at 9 types of mulch for commercial landscapes. Mulch improves soil moisture retention and helps reduce watering needs. It insulates the soil against extreme temperature fluctuations, which helps protect the roots. It can decompose naturally into the soil (depending on mulch type), which can improve soil quality. Mulch helps keep weed growth down and also makes them easier to spot and remove. It helps prevent soil compaction. Aesthetically speaking, fresh mulch breathes new life into a weather-worn landscape. It also acts as a guide to keep maintenance equipment away from roots and trunks in your landscape. Pine bark vs. shredded hardwood. Mini vs. large nuggets. Dyed vs. natural coloring. Choosing the right mulch for your commercial landscape can be a little overwhelming. With so many options and factors to take into consideration, well, it’s enough to make you second guess yourself. We want to make sure you’re choosing the right mulch, which is why we put together this breakdown of popular mulches to help you out in the decision-making process. Dying to learn more about how to protect your commercial landscape? Check out our guide for commercial property managers and owners. Shredded Bark: One of the most used and most affordable forms of mulch, shredded hardwood bark knits together tightly. It works well on slopes and won’t wash away as easily as mulch in nugget form. This byproduct from the lumber industry is easy to spread and slow to break down into the soil, making it a common choice for natural-looking pathways. With that said, hardwood mulch can increase your soil’s alkalinity. So if you do have acid-loving plants in your landscape, fertilizer supplements may be required to keep them happy. Wood Chips: This chunkier, more durable form of mulch is best used for playgrounds, paths and walkways. When used in the landscape, be mindful of the nitrogen deficiencies it can create in your soil as it decomposes due to its high carbon-to-nitrogen ratio. Straw (Pine Needles): Another mulch slow to break down, pine straw has a rust-colored hue that can give your landscape a soft, unique appearance compared to other traditional mulches. Pine straw can increase your soil’s acidity, making it beneficial to landscapes with azaleas, rhododendrons and some types of conifers. It is also a good choice for providing protection around newly planted ornamentals. 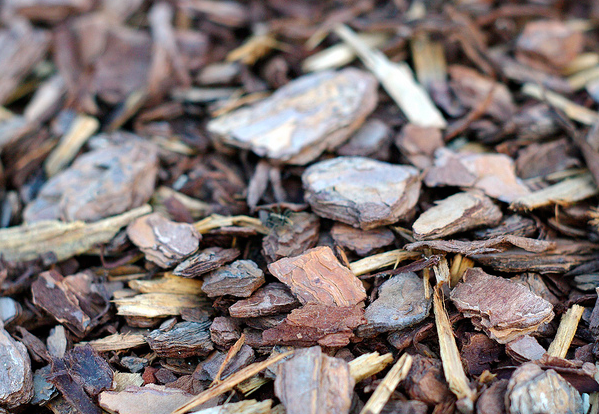 Shredded Bark: (Pictured right) Like shredded hardwood, this mulch is easy to spread in landscapes and provides beneficial moisture retention. This form of pine bark mulch breaks down much faster than mulch nuggets — conditioning the soil in the process. Nuggets: Whether you choose large or mini nuggets, this longer-lasting pine bark mulch is a much looser mulch that doesn’t excel in water retention or staying put. High winds and stormwater have been known to float the nuggets on occasion — something that can happen more frequently the larger the nugget. Most of us recognize this golden reddish mulch by its pleasant woodsy aroma. Generally more expensive than the other mulches mentioned here, cedar mulch lasts longer than most mulches thanks to its resistance to decay. Its oils are considered to naturally repel insects, too. BECAUSE this mulch is long lasting, it doesn’t provide much nutritional benefit to the soil beneath it. Unlike darker mulches that have a tendency to absorb the sunlight, the lighter color of cedar mulch works well to reflect sunlight during the warmer months. Cypress mulch gives landscapes a boost of long-lasting golden coloring and much like cedar, it reflects sunlight, naturally repels insects (except for termites) and is naturally resistant to fungus. Cypress mulch also helps to prevent soil erosion thanks to its matting capability. This mulch is kind of the new kid on the block; it’s used on playgrounds for its ability to provide a softer landing surface. However, it’s safe for use around plants, too. 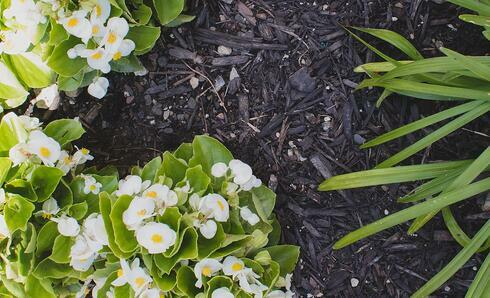 This relatively permanent mulch does nothing to improve soil quality, but it does deter pests and help prevent weeds. Though this mulch option is a bit on the pricey side, it doesn’t float and does come in a variety of long-lasting colors. Today’s dyed mulch is available in a number of colors — red, black and brown are the most popular. The mulch’s coloring comes from a water-based dye, making it safe for people and their pets. When dyed mulch is applied to your landscape, a curing period is recommended (usually a 24-hour period without coming in contact with water). Dyed mulches retain their bold color much longer than traditional, non-dyed mulches. 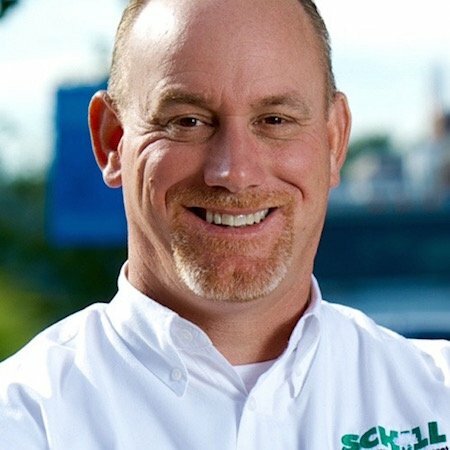 Ready To Talk Mulch With Schill? 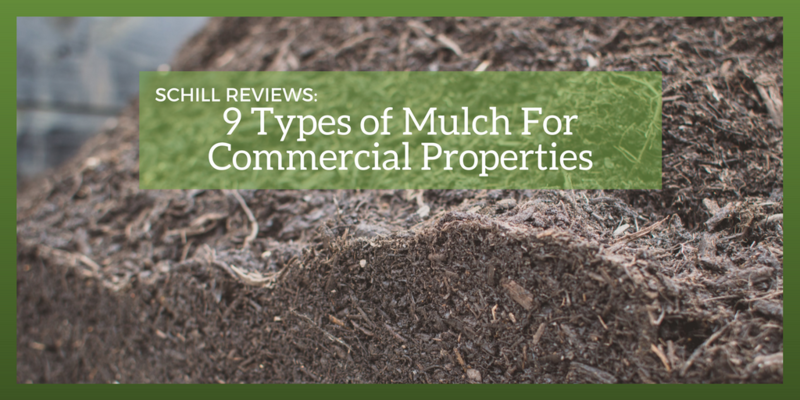 If you’re still on the fence about which types of mulch are best for your commercial landscape, well, you’ve come to the right place. With more than 20 years of commercial landscaping experience in Northern Ohio, we’ve spread enough mulch to know which ones will bring out the best in your property and its landscape. Call us any time at 440-327-3030 — we love talking mulch — or fill out this simple contact form and we’ll get in touch with you.